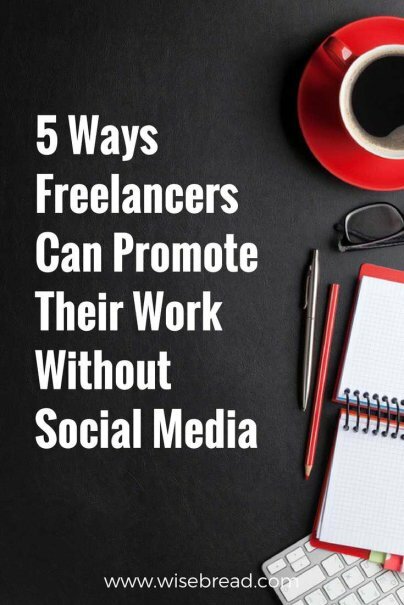 While social media is a wonderful resource for freelancers to promote their work, it can be exhausting to constantly stay plugged in and try to stand out in such a noisy world. Plus, in light of Facebook's privacy issues, many social media users are jumping ship — afraid of how the platforms are misusing their personal data. How is a freelancer supposed to get the word out and attract clients without social media? Here are a few ways. Your website should be the premiere place where you professionally showcase your work and let people know what you do. Of course, creating an amazing website will not instantly attract clients or visitors. You have to put in a little work to reel them in. Popular online platforms like Reddit, Quora, and Flickr can help you promote your freelance work. Reddit even has subreddit lists where freelancers can post that they are for hire. For freelancers who provide services like editing, legal advice, accounting advice, and more, answering questions in forums and on Quora can help you direct more potential clients to your website. Images or artwork shared on sites like Flickr should also provide links back to your site. Guest posting on popular sites and blogs is popular with freelance writers, but any freelancer can use this idea to promote their work and get more business. Whatever your freelance business is — whether it be web designer, voice-over work, or accounting — find out where your target client is going on the internet to find help and advice, and offer specific guest posts for these publications. Similar to the idea of guest posting, you can write a short ebook and offer it for 99 cents with free promotions on Amazon. Again, this idea can work for any freelance business if you angle the topic directly at your target client. Writing something like, "Why You Need to Hire a Voice Actor" or, "Why You Need a Copywriter and How to Afford One" is too generic. Instead, really hone in on your ideal client and write specifically to them. HARO, which is short for Help a Reporter Out, can be useful to establish yourself as an expert and get your name cited in publications. Reporters post notices on the site when they're looking for sources to interview for their stories. Many times, the reporter will link back to your website when the story is published, but other times they will only quote you. Either way, it's helpful to get your name in front of more readers and it gives you bragging rights on your website and portfolio.